The image below is of the Beinn Tarsuinn mountain range on the Island of Arran. This is a horseshoe loup from Glen Rosa by Brodick, up past the Glen Rosa camp site. I have not hiked this range yet, the image below is from the 2,867ft Goat Fell mountain, looking across to Beinn Tarsuinn. Most hikers go up the south west ridge, top left of the image below, then hike right round and down the southeast ridge, bottom left. 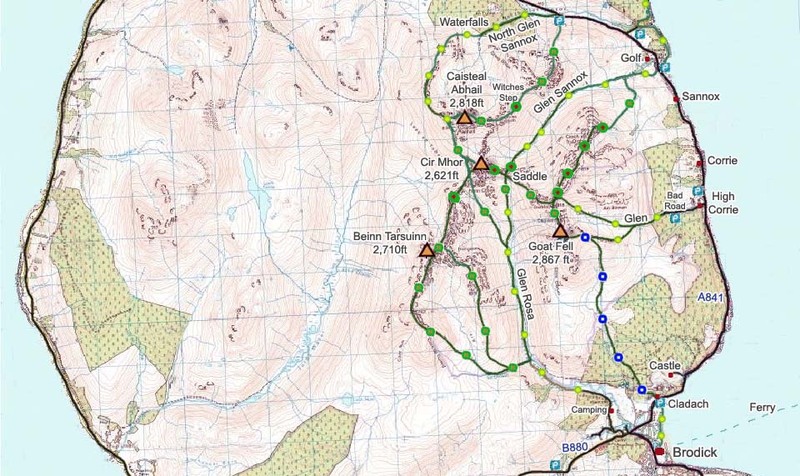 The Beinn Tarsuinn Map below shows the main routes onto the mountain. The Green and Yellow dots show the fairly safe northwest ridge route. The Green and Brown, and Green and Red dots, show the more dangerous routes. 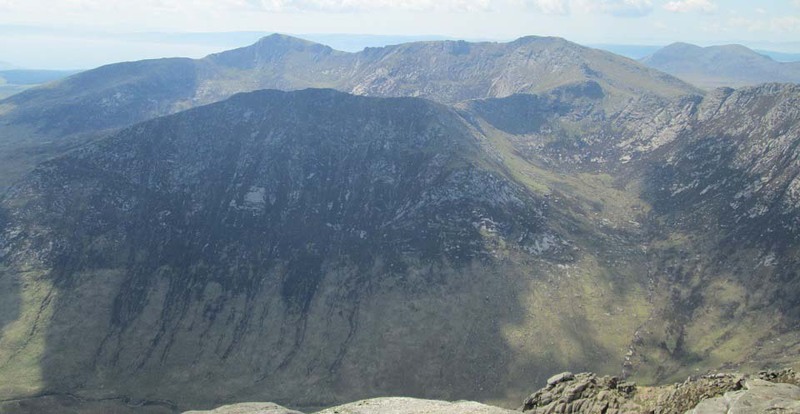 The Witches Step is normally regarded as the most dangerous section of all the mountain trails on the Island of Arran. The lower sections from the road onto this mountain are said to be a bit rough and boggy in places. Cir Mhor is often hiked from this hike, but that adds a lot to the hike and is quite a tough hike over to Cir Mhor, only for extremely fit and experienced hikers. For information on Arran and the Ferry, visit the Tour of Arran Page.